Marsaxlokk is a picturesque fishing village in the south east of Malta. 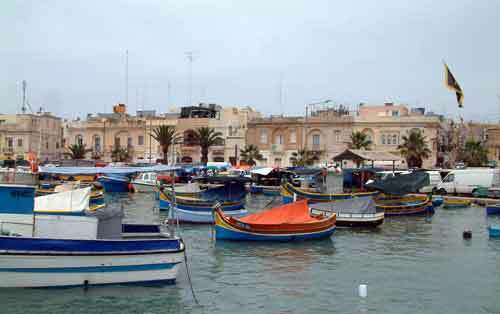 Visitors come to see the colourful Maltese boats and for the lively Sunday morning market. The market sells a variety of produce, fresh fish, fruit and vegetables, as well as Maltese handicrafts, leather and crochet goods, lace and tablecloths. Shoes appeared to be a good purchase with a wide choice across several market stalls and modest prices. There is a square with pavement cafes and restaurants, as well as restaurants in adjoining streets. Fish is a local speciality on the menu. Tourists can often be seen taking photographs of the boats in the harbour, buildings and street scenes.